Shrewsbury Town in the Community are offering a BTEC Elite Training experience for those interested in joining our BTEC Football + Education course in the next academic year. The session is aimed at Year 11 pupils within secondary schools across Shropshire who are deciding what to do as their next level of education and is designed for potential students to come and see what the BTEC programme from the partnership can offer. The course aims to provide transferrable skills which can be used to lead to a number of different sporting careers or further education at university. Modules on the course include; Coaching for Sports Performance, Sports Leadership, Anatomy and Physiology, Sports Psychology and Sports Massage. 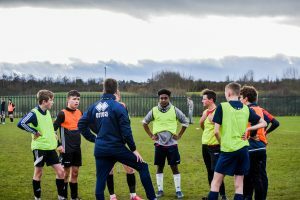 Pupils will also have the chance to take part in practical sessions, training three times a week as well as playing a weekly competitive fixture in the national CEFA league. During the 2019/20 season, the squad will have the opportunity to play games against Premier League and Championship clubs including Blackburn Rovers, Preston North End and Manchester City. For those not playing in the national CEFA league, football opportunities still arise through playing in the local Shropshire Colleges league, which will provide both game time and the opportunity for players to push on into the ‘elite’ squad in the national CEFA league should they impress. The BTEC Elite Training Experience will offer students a taster of what to expect from the course here at Shrewsbury Town in the Community with a session being delivered by our qualified coaches, who will also be able to answer any questions you may have about the course. The next of these experiences is set to run on Friday 22nd February at the Shrewsbury Town in the Community Hub, at Montgomery Waters Meadow SY2 6ST, between 12 midday until 2pm.